A 401(k) plan can be one of the most valuable tools you have for retirement savings. Contributing to your plan regularly allows you to cash in on the power of compounding interest. And as your investments grow, they're doing so on a tax-deferred basis. Receiving a matching contribution from your employer is an added incentive to save in your 401(k). Unfortunately, not everyone is taking advantage of their plan's match. According to Wells Fargo's 2017 Driving Plan Health Report, 37 percent of millennials, 31 percent of Gen Xers and 25 percent of Baby Boomers aren't saving enough in their 401(k) to enjoy the match. Understanding how costly that can be could be a motivator to step up your savings game. There's no standard rule for how much employers have to match in a 401(k). And some employers don't offer a match at all. On average, however, the most common match is dollar-for-dollar, on up to the first 6 percent in employee contributions. In other words, you'd need to save at least 6 percent of your salary into your plan to enjoy a 100 percent match. According to Vanguard's 2017 How America Saves Report, 36 percent of workers deferred 3.9 percent or less into deferred contribution plans in 2016. Twenty-three percent contributed between 4 and 6 percent, suggesting that many workers may not be realizing their plan's full potential. So what kind of impact can missing the match have on your retirement savings? What's a 401(k) Match Really Worth? Assume that you're 30 years old, making $50,000 a year. You're contributing 3 percent of your salary into your 401(k), with a 2 percent annual raise. Your investments earn a 7 percent annual rate of return on average. If your employer matches 100 percent of your contributions up to the first 6 percent of your salary, you'd have approximately $540,000 saved for retirement by age 65. That's not bad but consider how the numbers shift if you increase your elective deferral rate to 6 percent, with the same employer match. At the same rate of return over the same amount of time, your 401(k) would grow to nearly $1.1 million. That's a fairly large incentive to increase your contributions at least enough to qualify for the full match. Getting the match to increase your savings means more assets to draw on in retirement and it can help your investments keep pace with inflation. According to LIMRA, an inflation rate of 2 percent over a 20-year period can reduce the spending power of your investments by more than $73,000. Having more in a tax-deferred 401(k) could help to minimize inflation's impact in retirement. Qualifying for the full match in your 401(k) requires two things: knowledge of how your plan's matching contribution works and a willingness to adjust your contribution rate. For example, while dollar-for-dollar up to 6 percent may be the most common match, it's not the only matching scheme available. Some plans, for example, match 100 percent of the first 3 percent you contribute, then 50 percent of the next 3 percent. Still other plans may offer a blanket percentage contribution, regardless of how much you defer into the plan. Knowing what method your plan uses can help you make adjustments to how much you're saving. If you've reviewed your plan and your deferral rate and you're falling short, auto-escalation can help you reach your contribution target over time. Auto-escalation simply involves increasing your contributions to your 401(k) by a certain percentage each year. That takes the hassle out of having to remember to change your plan and if the annual increase coincides with an annual raise in the same amount, you likely won't miss any of the extra money coming out of your paycheck. Auto-escalation can be a powerful way to work towards getting the match over time. Research from Fidelity Investments shows that 401(k) balances reached an all-time high of $92,500 on average in the fourth quarter of 2016. The increase was believed to be due in part to the use of auto-escalation among employees. If your plan doesn't offer auto-escalation as an option, you can still reach out to your plan administrator to adjust your contribution rate each year. Review your budget first to determine how much you can reasonably afford to increase your contributions. Then, factor in whether you'll be getting a raise. From there, you can pinpoint how much you can add to your plan. Remember, there are limits to how much you can save in a 401(k). For 2017, the annual contribution limit is $18,000, or $24,000 if you're 50 or older. If you're able to hit that limit each year—or if your 401(k) doesn't offer a match—you can also save in an individual retirement account. A traditional or Roth IRA yields tax benefits for retirement and another path for adding to your savings. You just won't get the benefit of a matching contribution. Employer 401(k) Match Is One of the Best Investments. Don't Waste It! Are You Making These Mistakes in Your 401k Plan? How Do 401(k) Tax Deductions Work? 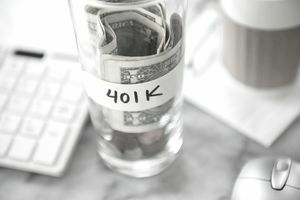 When Does It Make Sense to Contribute to a Roth 401(k)? Will Your Retirement Plans Change With Recent Tax Laws? Does the Roth 401(k) Alternative Make Sense for You? Do You Have a Lousy 401k?